If you are a horse lover, you most likely have been to Kentucky Horse Park in Lexington, where this four-legged, beautiful creature is on full display for visitors to learn about and fall more in love with. Horses were my first love and filled my life for years. When my husband suggested we stop at Kentucky Horse Park on our way back from Florida, I admit I felt a lump in my throat because it meant more than I could share that he knew how much this visit would mean to me. Justin didn’t know me in my horse-obsession and riding filled days of my childhood and early 20’s. He just knows the stories I share and the little glimpses into a passion I can’t quite explain. He knows these animals touch my heart. Horses have been my love since I was a small child. I still recall dancing around the house singing “I’m So Excited” by the Pointer Sisters when my parents finally agreed to let me start riding lessons. I still remember the powerful feel of riding a horse, the calming sensation from merely resting my head against a neck or the exhilaration of being astride a horse as we galloped toward four feet fences. I still remember the feeling of finding something I excelled at, the smiles on my face when I clicked with a challenging horse. While I grew up shy and not always outgoing around people, my confidence soared when I was at the barn or astride a horse. And I still remember the devastation I felt when my surgeon said I had to choose between my leg and riding horses. It was one of the few times I struggled to get up when cancer knocked me down. I of course chose my leg, and in doing so, took a break from my beloved animals. People kept telling me I could still hang out at the barn, give lessons, and watch my friends ride. I couldn’t. It hurt too much. For whatever reason, at that time being around horses reminded me I wasn’t invincible and made me face my own mortality, more so than even the cancer diagnosis. I am forever grateful I survived the disease and kept my leg (I say prayers of thanks daily). As the saying goes “Time heals all wounds” and in small ways horses have crept back into my life. I sponsored a rescue horse at Horses Haven for several years (and hope to again soon) and I find myself checking updates on horse racing and major show circuits. I’ve come to terms with the fact that I will never ride again and my life will never revolve around horses the way it once did. But I still stop in my tracks when something horse-related appears on the television or catches my eye in a store. Love and contentment still fill my heart and soul when I am in the presence of the four-legged creatures. I still whisper ideas of riding in my nephew and nieces’ ears and dreamily talk to Justin about owning a racehorse who will win the Triple Crown (a girl can dream!). So it meant the world to me that he would suggest spending the day at one of my favorite places. I was excited for him to explore the park with me, to share a little bit of my passion with him and in some ways, a part of me that I don’t get to share often. My family and I first visited Kentucky Horse Park when I was a child. My sisters weren’t quite the horse lovers (poor Kelli with her allergies!) but everyone was game to indulge and enjoyed themselves. A few years post-cancer, I returned during the Rolex Three-Day Event with some friends, which was an amazing experience. I really looked forward to sharing this special place with my new husband. As silly as it may sound, a whirlwind of emotions smacked me as we stepped onto the park grounds – happiness, hope, a little sadness and regret. Memories flooded back. Reminders of what I’d lost, of the challenges that cancer gave me and sometimes continues to give me, and ultimately, how far I’ve come. Yet the greatest emotion was the feeling of coming home, remembering the joy and contentment brought to me simply from being around these animals. 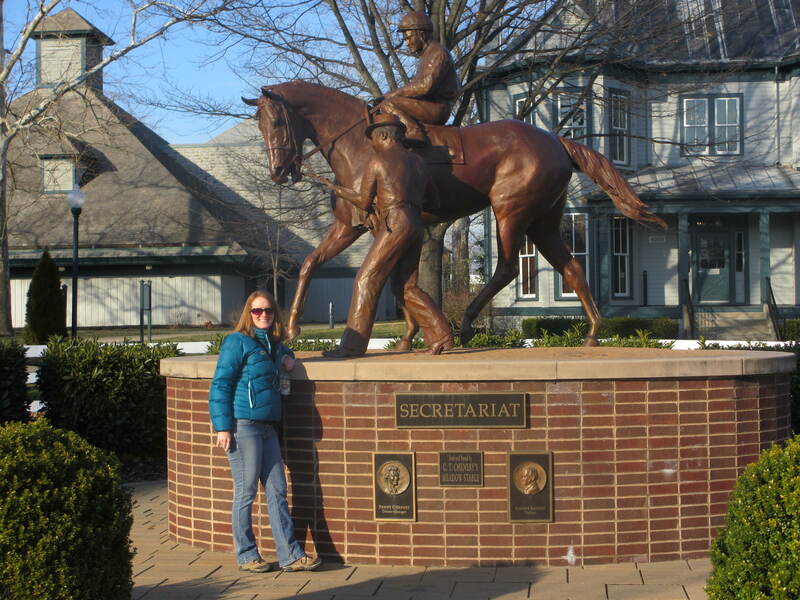 As my husband took my hand as we approached the Secretariat sculpture, I felt ready to regain my past. Our first stop was the International Museum of the Horse, a three-floor building that contains thousands of facts and items pertaining to horses. The Legacy of the Horse timeline wraps around to the second floor, highlighting relationships between horses and humans. 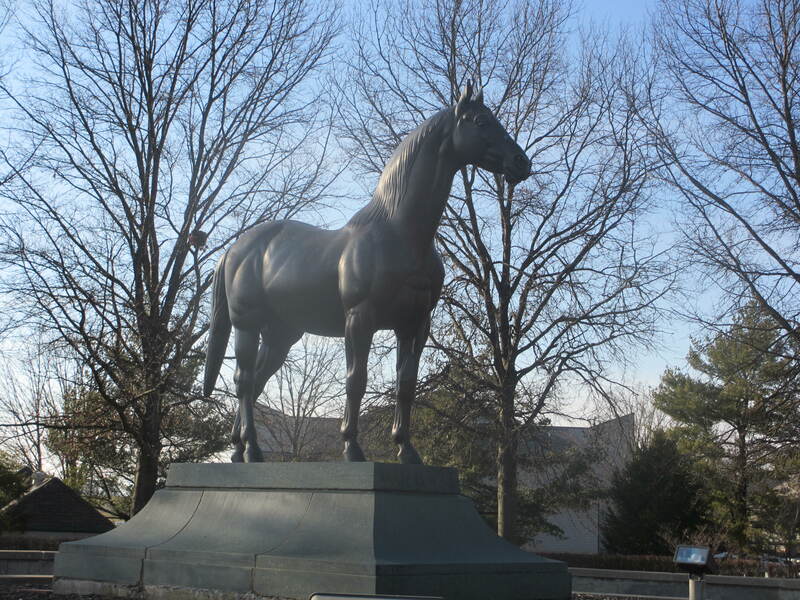 You can learn about breeds of the world, the different draft horses and see a tribute to the great Man O’ War. An exhibit on the Horse in Sport features eight disciplines of the World Equestrian Games, showing different equipment used in sports such as dressage and show jumping. An exhibit on the rise and fall of Calumet Farms was interesting, and even a bit sad to learn how this fabled farm almost collapsed. Hundreds of trophies were on display at the museum, rescued from bankruptcy auction by well-meaning donors. Walking through the Arabian galleries made me smile at the display on the Black Stallion books and movies. I own every book in the series, plus both movies. The Black was my favorite horse for years. The fascinating story of Affirmed, the 1978 Triple Crown winner, showed the touching relationship between some horses and their owners. advantages. Very few other guests were at the farm that day, giving us more access to the horses and no waiting. During presentations, we were right up front. And during the private off-site farms tour we took later in the day, the smaller group allowed us to wander through the barns and talk easily with the tour guide and farm staff. The downside was there were fewer program times during the day so if you missed one, that was it for the day. Many of the horses still had their winter blankets on too. Our next stop was the Hall of Champions where several successful horses are retired. Among them, Da Hoss, Funny Cide, Cigar, and Go For Gin. It was awesome to see two Kentucky Derby winners up close. 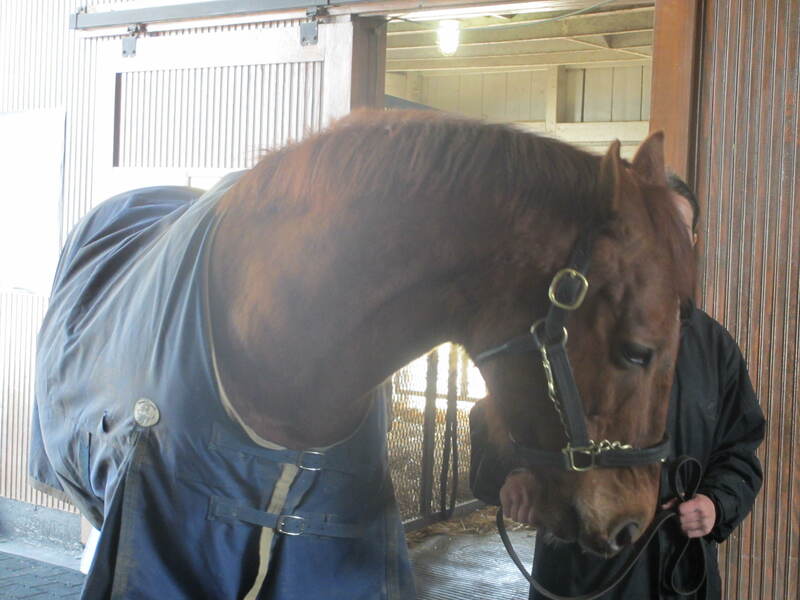 During the program, the groom brought Da Hoss, Cigar and Funny Cide into the aisle so we could take pictures while she told us their backgrounds. Unfortunately Go For Gin is a bit temperamental and anti-social so he stayed in his stall while she shared his successes. There are other horses housed here but we didn’t see them. 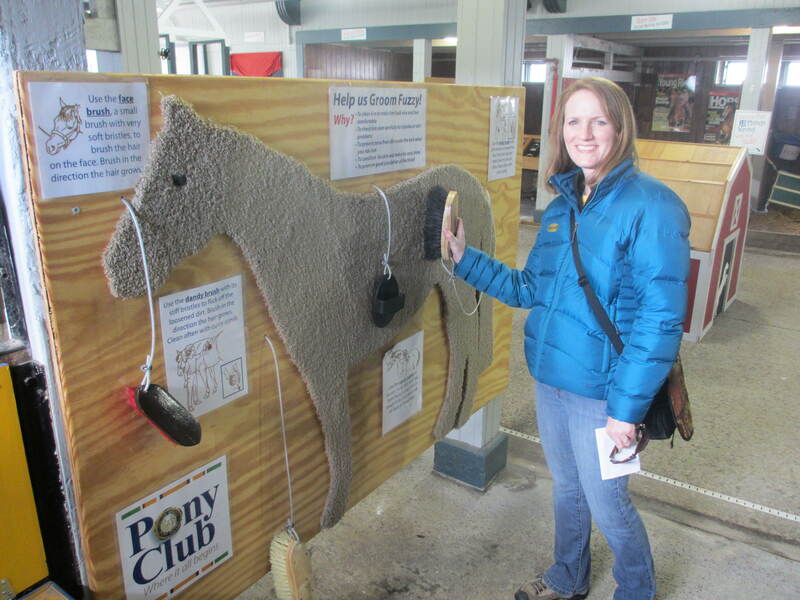 The Kids Barn, just opened in 2012, didn’t have live horses but it was filled with great displays of caring for a horse, how to groom, various safety equipment, horse illnesses, styles of boots and saddles and much more. During the summer, there are many activities for the kids to enjoy. Outside were small fences set up in a jump course, bringing back memories of hours spent building a jumping course in my backyard, “galloping” over home-made fences with friends (and sometimes our dog!). We wandered through the Mounted Police barn and farrier shop. The American Saddlebred Museum is also part of admission, however, we ran out of time to visit this. I thought the Horses of the World barn would have more horses than it did. Perhaps it was the time of year (during the summer there are programs where different breeds are ridden). There were many beauties though – Paint, Friesian, Arabian, Palomino, Appaloosa, Quarter Horse and others. It was feeding time when we walked through the Big Barn where the draft horses reside, which meant it was a bit loud (some impatience)! Some antique carriages also are on display. It’s obvious the horses are well-cared for and the stall and barns well-maintained. The staff was friendly and paused in their work when we asked questions. The many barn cats wandering around the farm made Justin’s day. Every time we walked into a barn, one or two cats would approach him. I teased him there was something for both of us – horses and cats. I caught myself several times just staring at horses playing in the pastures, admiring the beauty of acres of rolling land. Beautiful and peaceful. We both decided that if we lived closer to Kentucky Horse Park, we would invest in a seasonal pass. I would be there often, even just to walk the grounds, surrounded by rolling acres of fences and horses. If you are passing through Lexington, I highly recommend visiting the horse park. Regardless if you are obsessed with horses or just have an interest in seeing beautiful animals, many famous, you will enjoy the day. Our day got even better when we decided to buy tickets to Unique Horse Farm tours, which drives by several amazing horse farms and stops at three well-known, beautiful racing farms. I’d always wanted to take this excursion so I was almost bouncing up and down waiting for the bus. Stay tuned for details!